Every year my classroom has evolved in some way. There is always something that can be improved. If I didn’t use something the previous year or it didn’t work the way I intended it to, that something is now gone. Over the years I have simplified and rid the room of all of the “teacher posters” and gimmicks. What I have displayed in my classroom is there for my students to reference and utilize during the school day. Last Friday, my students were instructed on how to use a resource in our classroom, our “Author Wall”. It is my intention to instruct my students on how and why a person would want to use social media in their lives. 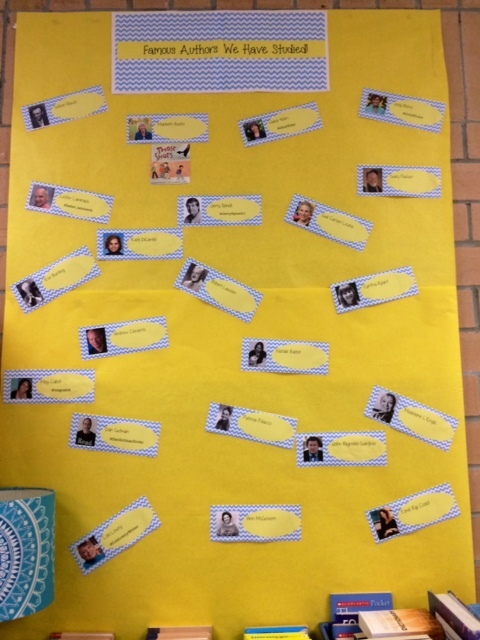 Near our classroom library I have displayed a plethora of authors we will study throughout the school year. Displayed is the author’s picture, name, and most importantly their Twitter handle (if they have one!). On Friday, my students and I finished reading Tales of a Fourth Grade Nothing. They thoroughly enjoyed reading the book. Who better to hear their thoughts on the novel than the author herself? Quickly, I passed out “Twitter Slips” to my students and explained what had to be included to ensure Judy Blume received our tweets. Students quickly jotted down notes on what they would like to say to Judy Blume while I explained that I would only post three of the messages on our class Twitter. Some students were not as eager to tell Judy Blume their thoughts and were allowed to read a chapter book silently while others wrote their posts. I observed what titles “disinterested” students were reading and found one of the authors on Twitter. When I explained that although they didn’t have anything to say to Judy Blume, when they were done reading the book they were currently reading, we could talk to the author they became excited. As educators we have to not only create an environment that lends itself to community and globalization, but we also have to understand that our students are humans too and have preferences. Everyone in class may not enjoy a specific book. What students enjoy is important. This is what engages students and makes learning real. Their interests. Their opinions. Their learning.